ITCL develops projects of Research and Development in the field of Machine Vision. Product quality in the production line. Using state-of-art Machine Vision technology ITCL had developed several projects in the field of Assisted Living, Augmented Reality, Industrial Inspection, etc. Structured Lighting cameras capture a 3D model of the environment by projecting an invisible pattern (by infrared light or laser projector) into the scene. 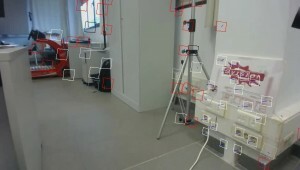 Cameras of this class, such as the Microsoft Kinect, Asus XTION or Intel RealSense allows the real-time capture and recognition of objects, persons and gestures. This powerful technology can be used for other applications as real-time mapping or reconstruction of large scenes, such as an office or residence. One of the applications developed by ITCL was the full 3D reconstruction and mapping of entire residences and health-care centres for Assisted Living, in the NACODEAL project. A single camera allo ws to a Vision system to detect objects and track them, but it does not provide any information about its depth, geometry or position alone. By combining two or more cameras in a Stereo Vision system, it is possible to determine the scene geometry without using dedicated lighting or projectors. This versatility makes this approach ideal for outdoors and non-controllable environments, and is often used by industrial robots and vehicles. Several Vision methods depends on very specialized equipment or a set of two or more cameras to capture the 3D surface of an object. 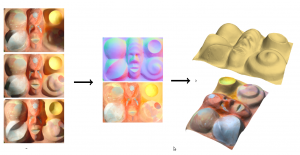 Photometric Stereo is an high-resolution approach that allows retrieve the 3D surface of objects by using a single camera, and 3 or more light sources. By analysing images obtained with varying illumination under the same perspective, not only the object geometry can be retrieved, as well its real colour, without lighting and shading effects. This is very useful in applications where the level of detail is important (dermatology, fracture analysis, facial recognition. The data can be used as well for classification and recognition tasks. 3D tracking is a necessity for monitoring and locating persons in to a controlled environment, particularly Assisted Living systems. In several places this is not feasible by conventional apparatus such as Wifi triangulation, RFID beaconing, etc.